Text & Photographs By Billy Brumble © All rights reserved. Recently, while travelling along Interstate 44, I saw a male bald eagle sitting atop a tree, not far from the Interstate. I stopped on the shoulder and managed to take three photographs of the majestic bird of prey (one in which he was looking right at me), before he flew off. The next morning, being anxious to have the film developed, I pressed the manual rewind button on my Minolta Maxxum 3 and heard the motor rewinding the film. I opened the camera back.... only to discover the film had not been rewound into the film canister. Fearing the worst, I took the film to a local developer and returned a couple of hours later. 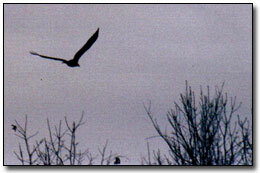 Well, as I feared, there were no pictures of the eagle in the tree, only of him flying away. 1. Take a lot of pictures of the subject, especially if it's one of those "once in a lifetime" photographs. Film is cheap and you can always sell the pictures, if they're of a good subject. 2. Make sure the film is completely rewound into the canister. I now go into a totally dark room, after the film rewinds into the canister, just in case. I should note that this is the first time anything like this has happened. My developer says the film leader had a ragged edge, which may have prevented the film from completely rewinding. My hope is that my misfortune will save another photographer from suffering the same fate. I'm still looking for an eagle shot, but I don't think I'll have too much trouble. I know of a few nests in central Missouri.